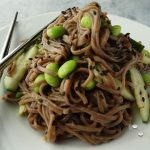 Soba Noodle Salad for #MeatlessMonday - This is a simple salad and packs up easily to take for lunch. Quick to put together, yummy and flavorful! Boil the soba noodles as per package instructions just to aldente, rinse well and drain well. If frozen, defrost the edamame. Combine the salad ingredients and mix will. Prepare the dressing - combine well and pour over the salad using half the sesame seeds. Mix well to combine. Sprinkle the remaining sesame seeds over the top of the salad prior to serving. Serve cold.